VANCOUVER, B.C. – Everybody knew Alex Burrows was fast. Just not this fast. With the second-speediest overtime goal in NHL playoff and finals history, Vancouver’s bitingly talented forward moved the Canucks halfway to their first Stanley Cup title. Burrows circled the net and scored a stunning goal 11 seconds into overtime, and Vancouver took a 2-0 lead in the Stanley Cup finals with a 3-2 victory over the Boston Bruins on Saturday night. Right after the opening faceoff of overtime, Burrows received a pass from Daniel Sedin and streaked down the side, eluding Boston captain Zdeno Chara behind the net. He extended his stick for a wraparound shot, beating out-of-position goalie Tim Thomas for his second goal of the game. Only four teams have rallied from a 0-2 series deficit to win the Stanley Cup finals in 46 tries, although Sidney Crosby’s Pittsburgh Penguins did it against Detroit in 2009. Mark Recchi and Milan Lucic scored for the Bruins, who trailed 0-2 in the first round against Montreal – losing both games at home – before rallying to win the series in seven games. “It was better today than in Game 1, and we’re going to have to keep that up if we want to score some more goals,” Lucic said. Burrows’ goal nearly was the fastest OT goal in finals history, taking just a bit longer than Brian Skrudland’s goal for Montreal 9 seconds into Game 2 against Calgary on May 18, 1986. 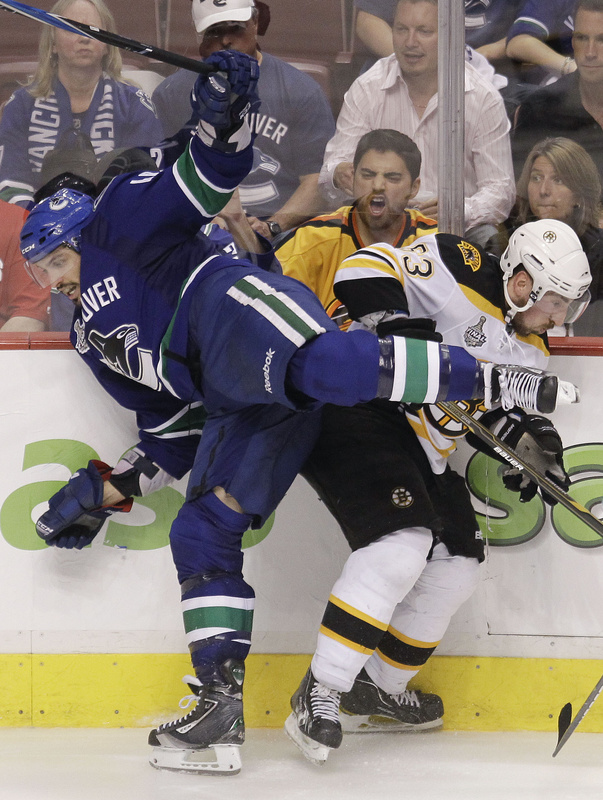 Roberto Luongo made 28 saves for the Canucks, but the night belonged to Burrows, who avoided suspension for this game after being accused of biting Boston’s Patrice Bergeron in Game 1. He scored on a power play in the first period, and he even set up Sedin’s tying goal with a sharp pass from the slot. Thomas stopped 30 shots for the Bruins, but his trademark aggressiveness put him too far away from his net during the brief overtime. Burrows used his speed to elude Chara before slipping the puck into Thomas’ unguarded net. Recchi put the Bruins ahead in the second period with a power-play goal just 2:35 after Lucic scored Boston’s first goal of the finals. Recchi, the NHL’s oldest active player at 43, ended the Bruins’ 5-for-68 power-play drought with a deflection from the slot. The Canucks got a pregame boost from the inspirational return of center Manny Malhotra, who hadn’t played since suffering a career-threatening eye injury on March 16. The Bruins had scored just one goal in their previous seven periods of playoff hockey before Lucic finally ended the drought in the second period. The Vancouver native bulled into the slot and batted the rebound of Johnny Boychuk’s shot under Luongo’s extended pad. The goal ended Luongo’s playoff shutout streak at 137 minutes, 26 seconds. Vancouver is chasing the first NHL title in its four-decade franchise history after two previous failed trips to the finals. The Bruins haven’t won the Stanley Cup since 1972, losing their last five finals appearances.